Since 1988 our organization has administered a program to encourage cross-cultural understanding between students in the U.S. and those living in other countries. Each year we offer students around the globe an opportunity to communicate with one another through the universal language of art. 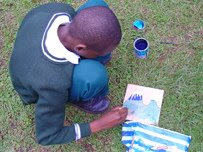 The program is the International Youth Art Exchange. Participation is easy — your students submit a drawing or painting about their own country. See requirements. If you participate, we would also like some information about your community and your school. Photographs of the student are especially welcome if available. We will incorporate these in mounting the art for display.In exchange, we will send the same number of American students’ artwork, which are yours to keep or give to your students. Each participant will also receive a special Certificate of Participation. Enclosed is a art identification form to list the student’s information. You may photocopy this blank as needed. Please type or print the information clearly in your own language and in English if possible. Be sure to attach a completed identification to each original artwork.